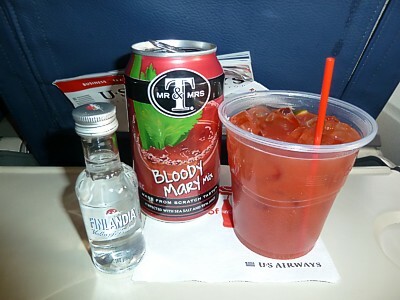 US Airways have scrapped free alcoholic drinks on all services in economy, however you can still get tea and coffe, along with most soft drinks, apple and orange juice, Bloody mary mix, and water. However, you need to forget the delights of a free bar in the sky; drinking on US Airways can be ruinously expensive if you are not from the US: Beware that US Airways don't really cater for non-US passengers on domestic flights (and flights to Canada, Mexico, & South America). Cash is only accepted on flights to Europe, the middle east, and South America. On all other flights US airways only accept credit cards. A UK or Australian credit card will accordingly have a 'foreign transaction charge' added to this, and to add insult to injury, you can't buy more than one beer at a time to only pay one charge. Hence, each beer will cost you nearly US$20. Thankfully on flights to the UK, US Airways now accept cash, following thousands of complaints. 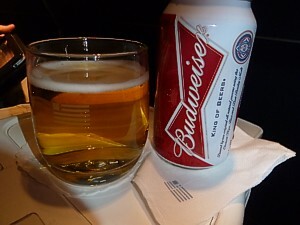 US Airways serve the US style of Bud on board (not surprisingly), which comes from the Anheuser-Busch brewer, alas. The beer is a classic light-bodied lager style beerm with a few faint sweet notes and negligible bitterness, leading to reviews characterising it as a beer of underwhelming blandness. 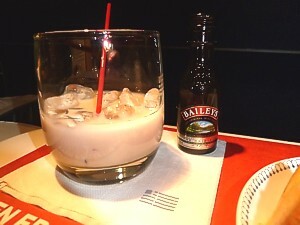 Mind you, it is prefectly drinking with the lack of any other options on board. 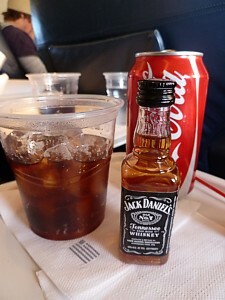 And absolute classic, JD & coke, although beware that in the US this is more commonly called a Jack and Coke, and so you may have to ask specifically for this, to avoid quizical looks from the crew if you are from the UK (and indeed, avoid the widespread term across Europe of a "Whisky Cola"). Jack Daniel's is a brand of sour mash Tennessee whiskey that is among the world's best-selling spirits. It is known for its square bottles and black label. Tanqueray Gin with Seagrams tonic. 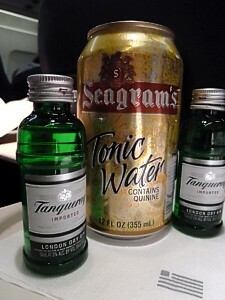 It could be worse, far worse, and indeed it's good to see that US Airways have good Gin from Blighty on board. Produced in Scotland, it is London dry gin (named after the distillation process not its place of origin). Curiously, in the US it is served slightly stronger than in the UK, where it is only 43.1%. Alas, you can't get a Bloody Mary made for you: it comes pre-mixed in a standard Mr & Mrs T's can, containing the tomato juice, and usually other spices or flavorings such as Worcestershire sauce, Peri-Peri Sauce, Tabasco sauce, beef consomme or bouillon, horseradish, celery, olive, salt, black pepper, cayenne pepper, lemon juice, and celery salt. This all goes well with the Finlandia vodka. US airways serve this is coffee in First Class, and oddly, always add the comment 'it is to go in the coffee', Well, you can if you want to, but to my mind its so delicious, you can drink it on its own in a glass with ice.